Those poor folk in Defiance can’t seem to catch a break! At the end of last week’s ep we saw a reporter stumble into Doc Yewll’s (Trenna Keating) lab, and promptly collapse with blood spilling from her mouth and eyes – and you know that’s never good! It seems a plague has hit, it only affects humans, and Irathients are carriers. Do the needs of one race outweigh those of another? The council, except for Amanda (Julie Benz) vote to have their Irathient population temporarily sequestered in internment camps until the cure arrives. Datak Tarr (Tony Curran) plays to the other council members fears, and says it’s ok to hate the Iratihients because in this case the stereotypes about them are justified. Yikes! Irisa (Stephanie Leonidas) is seized by Rafe (Graham Greene) before Nolan (Grant Bowler) is told, and he shows up ready to draw and put every single one of her captors down, until she talks him down. It was incredibly angering to see that moment, that people were so quick to judge, that an Irathient might be a carrier, just might, was enough to lock an entire population away. That’s troubling. And the scary thing is, I can see both sides of the argument (I really never wanted to grow up that much!). Nolan and Connor (Gale Harold) race out to recover the cure drop shipment that has been made, but have to negotiate with the E-Rep to get it. 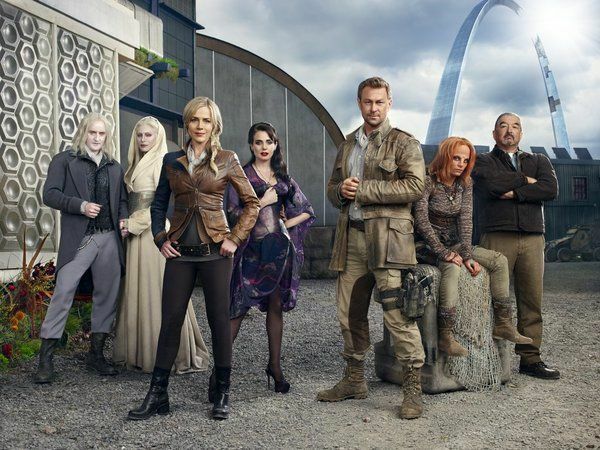 When Amanda falls sick, Stahma (Jaime Murray) and Datak seize the moment, and the Castithan steps in to serve as interim mayor, even while Alak (Jesse Rath) keeps vigil by his fiancée, Christie (Nicole Munoz), who has also fallen to the plague. Rafe and Quentin (Justin Rain) sit with her as well. 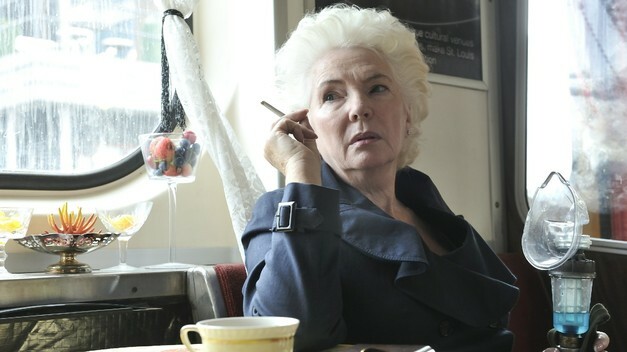 But Quentin has other things on the go, as Nicolette (Fionnula Flanagan) reveals the truth about his mother, and the fact that she and Rafe had an affair. All in exchange for the artifact that he has. Then of course, those humans keeping the Irathients locked up succumb to violence and strike out at their prisoners, leading to a death… the shots of Irisa following this are potent. All of it keeps rushing forward, as a sick Nolan and Conner are seized by some rogue Irathients and held captive, along with the cure, until their fellows are all released. Datak has other plans though, and his impatient, angry side reveals itself violently. But there was no one left to witness it, or maybe Nolan did… Just a thought. There are some troubling and powerful images this week, Irisa reacting to the death of her friend, the burning of the dead, Datak beating an Irathient, Amanda mourning, and then the revelation at episode’s end, that our dear doc, Yewll, has a history with Nicolette. There’s also Datak throwing his hat into the mayoral ring. This town cannot catch a break!! And yet, I keep coming back to visit it. I love this show so much, I’m very happy to admit I’m addicted to it. I’ve yet to try the game, but that day is coming as well! And in case you missed it, the first soundtrack from the television series, with music by Bear McCreary was released this week! 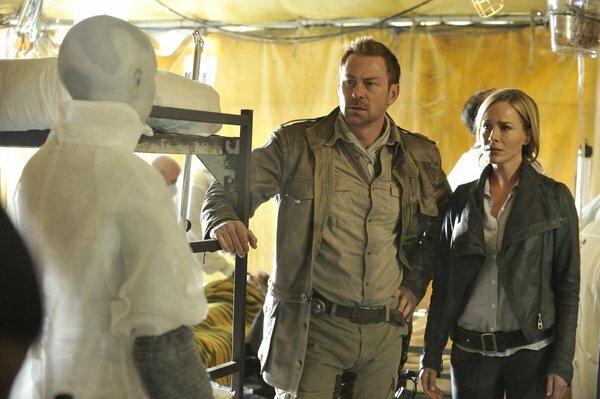 Defiance airs Mondays on Showcase, are you watching? Previous Post The Mind Reels Chats with OMEGA!